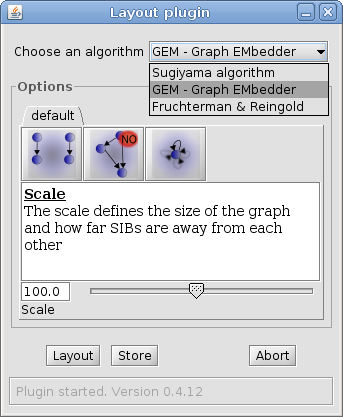 The Layouter-Plugin provides the facility to assign coordinates to SIBs and edges. Once configured the plugin can save the defined options and use automatic layout directly via Crtl-L instead of using the plugin via the plugins menu. The plugin defines three algorithms: A sugiyama style layout for hierarchical layouts and two force-directed layouts. The Plugin defines further 2 (more experimental from the integration) algorithms from the prefuse-library: ForceDirectedLayout and NodeLinkTreeLayout+RadialTreeLayout. Those are currently only availble via a maven dependency (groupId: de.ls5.layouter, artifactId: layouter-decorator-prefuse) and will be loaded from the Plugin if found on classpath. The Layouter also provides the facility to use graph layout via API as used, e.g., from the LearnLib for layouting hypothesis automata in active learning scenarios.